Olympia Time: What do you see in this chart? Mason County changing? What do you see in this chart? Mason County changing? 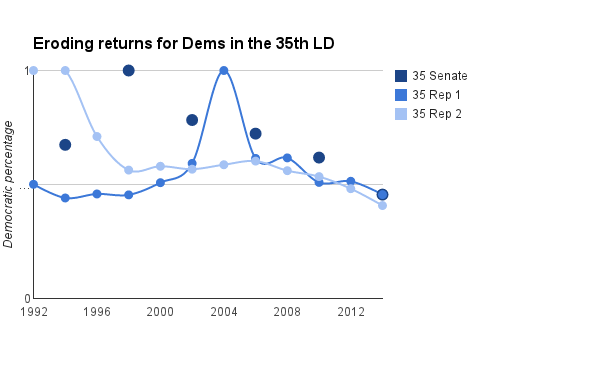 This is a chart tracking partisan returns in the 35th legislative district between 1992 and 2014. The lines track the two house seats and the dark dots, the senate. What I'm tracking here is how successful Democratic branded candidates have done over the past 20 years. An important note before you look any further. For 2014, I switched Sen. Tim Sheldon for his challenger Irene Bowling. In you own consideration, feel free to totally ignore that, but for the sake of argument, and to make an interesting chart, I did that. So, here's what I see: Throwing out two uncontested years, the Democratic brand in the 35th (greater Mason County) has been eroding. Mason County always struck me as an interesting place, the furthest inland outpost of the "Coastal Caucus" political type. I sort of wrote about this, the most non-partisan of Washington's political regions, here. I've also been thinking a lot about two other rural western Washington counties, Lewis and Grays Harbor. These two places share a river (the Chehalis), but party speaking, one is very Democratic, the other is very Republican. I've been wondering (baring very few other differences) why Lewis votes almost always Republican and Grays Harbor even more often Democratic. And, I think we might be seeing that difference in action in Mason County. In the past, it seems that Shelton was very much like Grays Harbor. But now, as we move through several elections, Mason County is becoming more dependably Republican. This is the first time since at least 1992 that the 35th have returned three state legislators that won't caucus with the Democrats. But, what are the factors behind this label change? You can argue that the Democrats Mason County sent to the legislator were always more conservative. Sure, I can take that. Other coastal Democrats were always different than King County Democrats. At least in the modern sense. But, why the label change? Here's on theory: one other thing has happened in the last 10 years, urban Democrats have been focussing energy on Mason County and Tim Sheldon. Sheldon's break with urban Dems has been at least ten years in the making, since he chaired Democrats for Bush in 2004. He also led a rebellion against a Democratic budged in a few years ago and then famously caucused with Republicans during the last two legislative sessions. And, since then, Democrats in other parts of Puget Sound have been taking a harder and harder aim at him. The high point was this year when a traditionally funded Democrat faced off with Sheldon in the general, and lost. So, maybe this really isn't an act of Mason County voters changing their stripes, but a slow-motion erosion of the old-style coastal Dem with a modern conservative Republican.